Consists of 47 letters from F. G. Browne on behalf of the Publishing Department at Chicago-based American publisher A.C. McClurg & Co. to the firm’s London literary agent C. F. Cazenove, regarding the sale of American titles in England, financial transactions, and other business matters related to publishing. Includes seven essays (likely unpublished) on American affairs and economic opportunities, dating from 1768-1780, by British colonial official, Ambrose Serle (1742-1812). The Aurelio Cortés Collection of Reinaldo Arenas contains a small collection of letters and correspondence with Reinaldo Arenas and others, as well as typewritten drafts of Arenas’ articles and essays, some of which are dedicated to Cortés, a personal friend. Also present are typewritten drafts of Cortés’ own work on his friendship with Arenas. Consists of 12 letters from William, E. B., and Robert Patten to their brother-in-law and sister, George N. and Olivia Cole about their experiences in San Francisco during the gold rush, along with additional Cole family documents. Primarily includes correspondence kept by merchant and politician David Gelston during his time as Collector of Customs for the Port of New York (1801-1820) along with some correspondence of Floyd and Delafield family members. This collection consists of selected papers of Frederic Dennis regarding his aunt Sylvia Beach, the founder and owner of the bookstore Shakespeare and Company. Recent additions consist of letters (1977-1988) to Dennis from Beach scholar Noël Riley Fitch regarding the Beach family. Granville Austin (1927-2014) was an independent scholar and political historian known for his work on India’s constitution. The collection is composed of Granville Austin’s research files on India, mostly in the form of published articles or book excerpts that Austin collected and often annotated. The majority of the research files, notes and drafts relate to Austin’s second book, Working a Democratic Constitution, but some files relate to his first book, The Indian Constitution: Cornerstone of a Nation. Topics documented in the collection include the Indian constitution, center-state relations in India, Indian politicians and political parties, U.S. foreign relations with India, cases tried before the Indian Supreme Court, and various other subjects related to India’s political and legal systems. Research material on the Middle East, material relating to Austin’s other writings, professional and personal correspondence, including State Department files, as well as U. S. Information Service photographs and negatives compose additional parts of the collection. Louis Jefferson (1927-2006) served as John Foster Dulles’s personal security guard for five years until Dulles’s death in 1959. The collection is composed of scrapbooks created by Jefferson documenting his travels with Dulles. 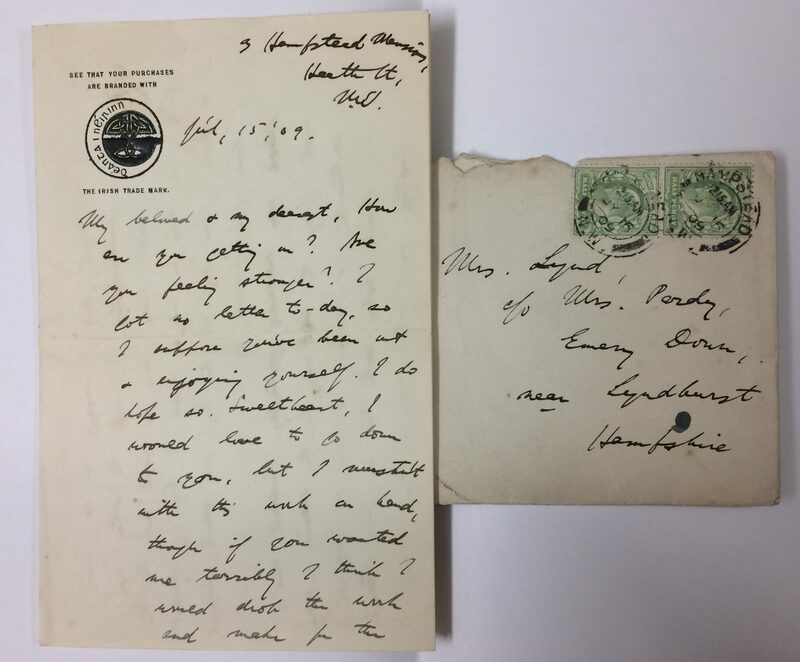 Consists of over 40 letters from New York City bookseller and politician Philip Ten Eyck to Philip J. Schuyler that primarily document local, regional, and national politics as well as other prominent current events around the turn of the 19th century. 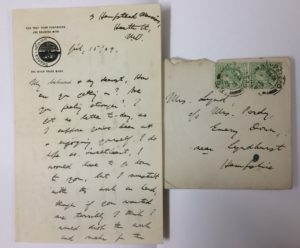 Consists of three decades of correspondence between married Irish writers Sylvia and Robert Lynd, comprising over 260 letters written in English and Gaelic, that span most of their relationship from 1905 to 1937. Thomas Colchie (Princeton University alumnus, Class of 1964), is a translator, editor, and literary agent with a specialization in Latin America. His papers consists of correspondence from Jorge Amado, António Lobo Antunes, Guillermo Cabrera Infante, Carlos Drummond de Andrade, Oswaldo França Júnior, Ignácio de Loyola Brandão, Manuel Puig, Murilo Rubião, Ernesto Sábato, José Saramago, Moacyr Scliar, João Ubaldo Ribeiro, José Luandino Vieira, Néstor Almendros, Adolfo Bioy Casares, Elizabeth Bishop, João Cabral de Melo Neto, Joaquim Cardozo, Philip Roth, and Alan Warner. Consists of an unpublished manuscript treatise, dating from the late 1760s, most likely authored by British military officer, Thomas Howard (1735–1778), as well as an 8-page letter from Howard written while he was commander of the Grenadier Guards during the American Revolution. Charles Ruas is an American author, interviewer, editor, literary and art critic, and French translator, who served as the Director of the Drama and Literature Department for New York’s Pacifica radio station WBAI-FM in the late 1970s. Additions to the papers include recordings and descriptions of his radio programs, a public television program proposal, and materials related to artists and authors with whom he worked. A recent addition to this assembled collection of material by or about physicist Albert Einstein consists of four 1941 photographs of Einstein in Princeton taken by photographer Roman Vishniac (1897-1990). A recent addition to this assembled collection of material by or about 19th century English art critic, social reformer, and educator John Ruskin consists of six signed autograph letters from Ruskin to Professor Henry Attwell, discussing Albrecht Dürer’s Knight, Death and the Devil, abstracts of his work, photographs of his pupils, geological specimens, and other matters. Recent additions to this collection of selected papers of author and former Princeton University Library Curator of Rare Books and Manuscripts Lawrance Thompson include typescripts of his lectures on Ralph Waldo Emerson, as well as for his “Four American Authors” course. Some recent additions to this collection of modern English and American literary manuscript materials include manuscript drafts of “The Mistakes, or The Happy Resentment, A Comedy” and “Undkan King of Tartary” by Henry Hyde, Viscount Cornbury (1710-1753); and a collection of 46 loose manuscript verses collected by members of the Hyde and Villiers families (Earls of Clarendon). New additions to the finding aid include speeches and lectures; diaries, logbooks, and address books; photographs; awards and memorabilia; and audiovisual materials. Additional writings (short fiction, poetry and lyrics, dramatic works, non-fiction, children’s literature, and personal and miscellaneous writings) are also now described in the finding aid and will be available via digital access in the reading room pending the completion of digitization. The correspondence series has been re-opened after a restrictions review. Correspondence features personal and work-related correspondence addressed to or from Eltit. Only a select portion of the correspondence remains closed until 2041.